Salomon's Rocker 2 108 returns for the 2013-2014 season as your go-to "everyday powder ski," replacing Salmon's excellent but highly specialized Czar. Compared to the Czar, we get undeniably better versatility in the Rocker 2, though perhaps at the cost of some of the Czar's deep-snow magic. Both skis employ twin tip designs, adding park rider playfulness and looseness in the tail, and both skis are 108 millimeters at the waist. Thanks to its slightly-spoony tip, the Rocker 2 picks up a touch more surface area overall. To me, one of the big stories with the Rocker 2 is that it is much, much better on hard snow than the Czar. As noted in my K2 Annex 108 review, this year we see a marked improvement across the board when it comes to hard snow performance in the All Mountain and Powder ski categories. The manufacturers have obviously been listening to the buzz surrounding skis like Blizzard's Cochise and Nordica's Patron, and they've decided to join the bandwagon by adding hard snow credibility to their own Big Mountain offerings. That's certainly not a trend I'll complain about; as much as I love my Czars in deep snow, I've come to dread riding them in anything else. On the other hand, given that the Rocker 2 108 replaces the Czar, we see very clearly the cost of adding versatility versus pure specialization: the Czar's wonderful quickness has been muted. The Rocker 2 gives us better long-radius turn stability in all conditions, most notably on-trail. 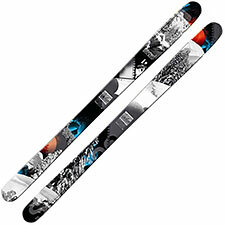 The ski delivers smooth, reliable arcs, even on firm snow. Critically, the Rocker 2 is always happy to finish its turns, unlike the Czar, which tends to rail out as the snow hardens. But you will miss the Czar's quickness, especially in tight scrapes like powder bumps or tree glades that suddenly close out. In contrast, as things open up, you'll like the Rocker 2's spoony tip, its smoothness, and its stability at speed. Subjectively, I would have liked a little more sparkle in the Rocker 2's ride. The Czar in its element is a ski that delights the soul of a powder chaser. The Rocker 2 never evoked quite the same reaction for me. Objectively, Salomon has effectively addressed the worst of the Czar's liabilities, and the Rocker 2 is beyond question a solid entry within its class.